To demonstrate my understanding of colour, tone, composition and the development of my technique in my chosen medium. I will build on my learnings so far in this course and consider viewpoint, perspectives, tonal values, contrast, relationships and mood/atmosphere. Luminosity: How to depict light? Only in contrast to shadow as there is saying there is no light without shadow and what is also core of the ‘chiaroscuro‘ style? Can there be light perception beyond tonal value contrast? Thinking about the exaggerating aspects of complementary colours and the context of light installations by e.g. James Turell? Blurred vision: the physiological phenomena of the peripheral and foveal blur of the human eye and seeing. Where one have a clear and sharp vision in the center of the sight with blurred edges towards the periphery, or towards closer and more far away objects. Perhaps also beyond this? Where peripheral vision can add new dimensional of visual perception as wonderfully demonstrated in some experiment by Emily Knight, Arthur Shapiro & Zhong-Lin Lu: “Peripheral vision is not just a blurry version of foveal vision” (Knight, 2008). Contextual works are from Gerhard Richter, with a blur across the entire painting as perceived in out of focus camera images (with aperture or movement) And there are many other artists who build on that idea. Illusions (Hess, 2016): Like Chevreuls’ illusion of perception of tonal and colour contrasts and the blurred vision illusions are based on physiological phenomena of the human visual system. 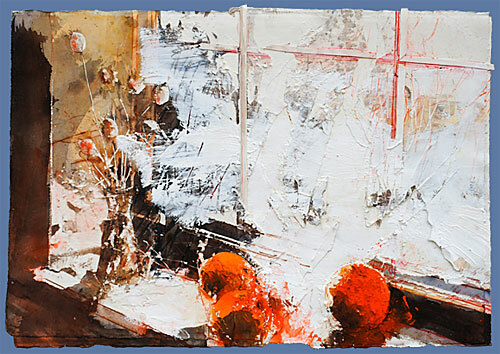 Edges: hard, soft, blurred, distorted (context: Alex Kanevsky or Ann Gale), Or in context of above mentioned Craik-O’Brien-Cornsweet illusion. Layering: showing process of painting in context of Jenny Saville. Not yet explored – to do. Scale: full body involvement of intimate painting? I worked in part 2 mainly on small scale (around 40 x 30 cm) so the question would what will change at large scale? Conclusions: too many aspect to be tackles in the scope and time frame of this assignment. Surely to keep in my repertoire as elements for further exploration and to get some guidance from my tutor on. Searching for a subject: I rejected on my works so far on still life in project 2 (click here) and project 3 (click here). I elaborated the theme of mirror, reflections and glossy surfaces, at times some looser brush strokes and was intrigued but also been challenged by pure interior subjects. Latter mainly because of the at times quite formal aspects of perspectival tasks of line. I felt more at ease with mundane objects now (context: Giorgio Morandi). While searching through my home I felt intrigued by the various aspects of light and illumination. Something I partly investigated on in project 2 ‘Flowers’ (single light) and project 3 (lamp light). I will amend the post after receiving back my sketchbook. Sorry to those reading my blog and missing them. For this did take some pictures as I used paper copies of them for deeper investigation of tonal values and colour exploration in my sketchbook. Here are the few, starting with ink and wash and continued on paper copies of it with tonal scale of seven in acrylic. I explored two different scenario – one lighter (high key) and one darker (low key) with more focus on light contrast. The purpose was to achieve max perception of direct light perception through the window. REMARK : Same approach as above, no images – reasons mentioned. During project 3 I got a slight idea about how to evaluate tonal values and colours. Now facing a darker evening scene with the one light source in front of me I was really challenged with the fact that my lowest value (white) on the seven value is still darker compared with the lowest values and colour in front of me. So how can I evaluate it now correctly. As before I placed my tonal value scale just on the object itself and got illuminated by the same light what worked so far. But how to do if I cannot get there? At the end I stopped placing this little paper with my values and colours on the objects and compared them with my naked eye only. Lesson learned: Relationship of values and colours to each other is more important than chasing an objective colour. With my subject settled and my first sketchbook studies completed I started to contextualised my possible approach further. Based on my initial thoughts. => distorted edges with perception of non focus blur that conveys a more realistic view seen from a distance. Colour and values are more important than form. => a minimalistic tonal painting working with edges and planes. Form perception through interplay of broad planes and edge control. => Mostly in chiaroscuro with brown black and yellow-orange. What is intriguing is the blue-violet coat of Santa Maria that is in the transition of the dark background and the yellow-orange lit ‘inside’ area. The colour really adds an element to the painting that I understand in the frame of the ‘watercolour illusion’ and concept of complementary colours that the light area gets even brighter by that. => palette knife paint application based on at times drawn work and planes in contrasting tonal values. and some other works by Alex Kanefsky. In inspiration of my tonal values studies and some colour concepts of complementary colours and watercolour illusion: White light space with orange edges and enforce by a complementary blue-violet edge. More expressive paint application. A combination of drawn forms and painted planes. My sketchbook studies done in gouache. Adding some more details in the foreground, glass, books and colour stripes on the bed linen. Imprimatura with brush of main colour of interior in orange (on seven values scale: value 2) and grey (value 6) and black for lamp stand. Changing lamp area and going back to white more more luminosity perception. Subtractive work with scrapping of paint to create marks and variations in colours. At the later stage of the painting I felt reminded of some works by Joan Eardley. Finished painting are at the top of this post. Overall I think that I captured the idea of lumination comparing a day light and a night light scene. I referred for the first painting quite on Pascal Danz’ ‘Interior’ and not sure whether this is now too much of a copy. I am satisfied with the composition and the way I depicted the with blurred edges contours of shapes. The coloured stripes of the bed linen at the bottom left corner are adding an appealing point of interest that continues with the blue and red book. What could I have done differently? Perhaps pushing more the limits of colour contrasts not only at the edges of the window. However, I kept a rather limited colour palette and a rather high key painting for a more serenity and calming atmosphere. I have the feeling that this painting is not quite resolved looking back at the contextual works by David Tress. I feel that I need more practice working with a palette knife and combinations of additive and subtractive paint application. Due to time constraints I had to finish the work in one session (besides letting the imprimatur drying first). Perhaps with the paint getting dry now I could work on an additional layer of paint for further ‘distortion’. However, I am not sure whether this would be beneficial of the subject matter. Looking at works by Alex Kanevsky I am wondering how to capture his unique visual style. For me more to explore and more time to spend on that. Overall, I do think that I kept the atmosphere of the scene as well as my own emotions to it – and to the fact that I worked late night and on delayed timeline. Relationship of values and colours to each other is more important than chasing an objective colour. Evaluating colours are a subjective endeavour that depends quite a lot on illumination. Now I understand better why colour contrasts were often used by artists to be less dependent on the illumination of the observer. Working with colours on a limited palette truly brings another dimension of contrast and highlights to a work compared with drawing. Working without brushes makes my painting process a more intimate approach – similar to drawing. Color and tonal values: Exploring different way of working with color contrast to enforce luminosity. Taking more time for assignments work and making with more paintings to learn better from first and following works. Exploring other approaches of abstract paint application for a visual perception of reality as a combination of blurred edges and realistic values. Howells, R.D. and Negreiros, J. (2011) Visual culture. 2nd edn. Cambridge, UK: John Wiley & Sons. Pallasmaa, J. and Holl, S. (2005) The eyes of the skin – architecture and the senses. United Kingdom: Wiley, John & Sons.